When the sun rises over New Mexico’s Sangre de Cristo Mountains, the southernmost range of the Rockies, it spreads a wash of color that illuminates the grandeur of this land of enchantment. The state has breathtaking natural beauty, a cultural history that represents thousands of years of people living here and calls to artists of all mediums to come and create. Here are 10 of the best museums in New Mexico. The everyday art of cultures from around the world is on display here. This is the largest collection of international folk art in the world. It might take a while to see all 130,000-plus objects that represent more than 100 countries, but it’s worth a stop in Santa Fe. Dinosaurs roam the halls including Stan, the second largest Tyrannosaurus rex skeleton ever found, in exhibits that highlight New Mexico’s natural and scientific history. There’s also a planetarium that unlocks the mysteries of the New Mexico night sky, as well as the Startup gallery which connects visitors to the revolutionary history of the personal computer craze. This is a must stop in Albuquerque for all science enthusiasts and history buffs. Larger-than-life flowers and expansive landscapes capture New Mexico’s beauty under the brush strokes of this iconic artist. Get an up-close-and-personal look at some of her most well-known paintings and photographs, as well as details about her extraordinary life and her impact on American modernism painting. 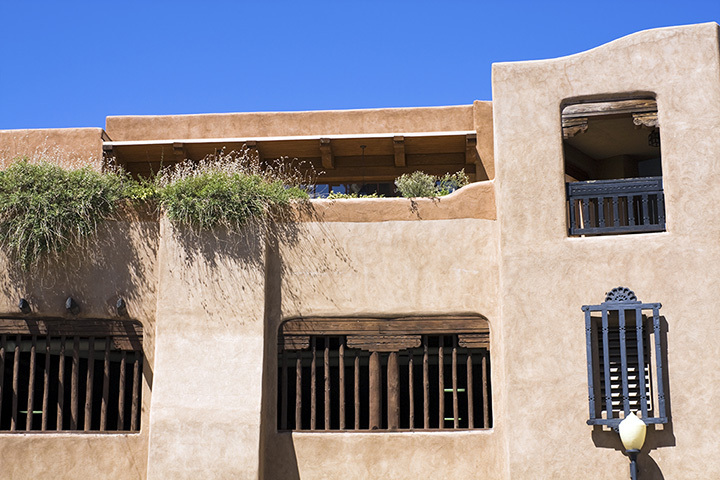 Seeing the natural world through her eyes at this Santa Fe landmark is a transformative experience. Alamogordo sounds like it could be one of Jupiter’s moons, so it’s appropriate that the town is home to this off-the-beaten-track museum. Housed in a golden glass cube smack dab in the middle of the New Mexico desert, it even looks a little other worldly. Composed of nine different exhibits with a heavy emphasis on the state’s involvement in the U.S. space program, this is an out-of-this-world experience. Located in the heart of Albuquerque’s Old Town, this municipally-owned museum fea-tures a comprehensive collection on the art, history, culture and people of the South-west. A half-century of curating the region’s finest artworks provides visitors with an unforgettable insight into the region’s rich cultural legacy. This safe-zone for those interested in understanding the events that shaped the Atomic Age chronicles the story of nuclear history and science in the United States and the important role New Mexico has played in the story. Lots of interactive and hands-on exhibits make this a great place for adults and children. Spend some time in Albuquerque learning about the past, present and future of nuclear technology. The life stories of the Pueblo, Apache and Navajo native peoples come to life through the preeminent collection of Native art and material culture on display here. Pottery, weavings, jewelry and paintings representing the unique traditions of each Native group connect visitors to the ancient and beautiful history of the Southwest’s indigenous populations from ancestral to contemporary times. The permanent exhibit, Here, Now and Always, captures the essence of this narrative. Be prepared to see the arts in a new way at this museum and contemporary art center that challenges your perceptions about the modern art world. Renowned for its biennial exhibitions that showcase the innovative and inspirational art of today, you’ll leave with a new found understanding and appreciation of contemporary art. Located in one of Santa Fe’s unique urban spaces known as the Railyard. You can’t find a more extensive collection of Pueblo Indian culture, history and art than at this museum. Owned by New Mexico’s 19 Indian Pueblos, it’s filled with thousands of authentic artifacts from pre-Columbian to current time, as well as opportunities to try your hand at pottery-making or gourd painting, taste a Tewa Taco or traditional Pueblo oven bread. Immerse yourself in Pueblo culture at this vibrant venue near Old Town Albuquerque. You’ll feel lighter than air and achieve new heights of understanding about the history, science and technology of ballooning at this colorful and educational environment. Channel your inner aeronaut as you look upward at baskets and gondolas, imagining the sights you’d see floating high above the earth.